Having a strong arm is critically essential for a good baseball player. The strength of your arm plays a central role in all baseball positions, including batting, pitching and fielding. You can hit home runs, pitch blazing fast baseballs and field with accurate and quick throws to the home plate, all by virtue of a strong arm. And it is incredibly simple to gain solid strength for your arm, although it requires diligence, hard work and persistence. Following are a number of excellent exercises that will condition your arms for great strength and solidity, enabling you play better on the field and to avoid any disabilities during the game. 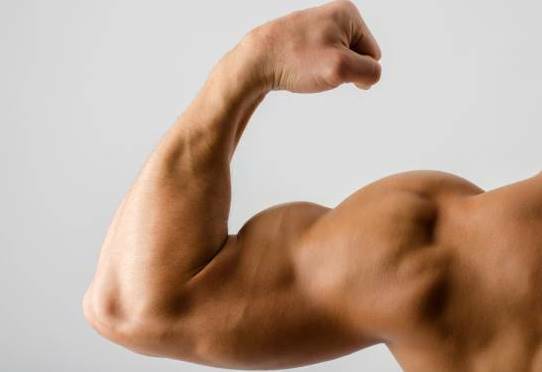 This is a relatively simple exercises to build arm strength. Hold a moderately weighted dumbbell in each hand, with the weight such that you don’t feel overstrained. Hold your elbows out in front of you and have your palms facing up. Now slowly lift the dumbbells towards your chest. While doing this, the position of your elbows should be locked and you should try to keep your wrists stiffly in position. Do 3 to 5 sets of this exercises every morning and you will feel visible difference within a few days. Triceps are one of the most important arm muscles involved in throwing and other intensive baseball activities. A great exercises to strengthen your triceps is to use the regular bench-press. Lie down on the bench and grip the bar above you. The grip should be almost shoulder-width apart which will exert a greater strain on your triceps and by working them, will strengthen them. Add a smaller weight initially and work with them by slowly bringing the bar down to your chest and lifting it again. Over time, you can add more weight. Try 3 to 5 sets of this exercise every day. When pitching and throwing, wrist strength plays a vital role. If you have a strong wrist, you will be able to throw harder, quicker and farther. A simple yet great wrist exercise is to include your forearm at 90-degrees to your shoulder and hold a baseball in your hand. Now support your elbow with the other hand and throw the baseball by using only your wrist. A few tosses in this position every day will add significant strength to your wrist. At the baseball field, you will be required to throw the baseball over varying distances, sometimes over 30 feet, at other times over 60 or 90 feet. So you should exercise long-distance throwing a few times every week. Every time you go practicing this exercise, practice first with a shorter distance. Practice 20 to 30 throws on 30-feet distance, then 20 to 30 throws on 60-feet distance and similarly on the 90-feet distance. Practicing throwing at different distances will ensure that you have sufficient arm strength to range all distances on the field with your throws. Hold a 5 pound dumbbell in each hand so that your arms are extended on your both sides and the hands are facing inward. Now raise each hand at a 45-degree angle and bring your arms to shoulder height without losing the fixed position of the elbows. This will strengthen your muscles all the way from the shoulders to the hands. Performs 3 to 4 sets of this exercise. Make sure that when doing the exercise, you raise and lower your arms slowly and deliberately. One of the simplest yet most effective exercises for building your arm strength is do regularly do push-ups. To perform push-ups, place your hands shoulder width apart with palms on the ground. Plant your legs with the balls of your feet touching the ground. Now keeping your body straight, slowly raise yourself up on the strength of your arms and once fully raised, slowly bring it down. 3 sets of push-ups everyday are one of the best exercises to build solid arm power. One of the great ways of building arm strength and at the same time, improving your throw is to practice quick tossing. For this exercise, you will need a partner. Have the partner stand nearly 10 feet from you and start rapidly tossing a baseball to and fro between each other. Your aim should be to toss the baseball right, quick and with a solid strength. This will give you a feel of being in a real baseball game and working under a clock, you will be able to better condition your arm’s strength to real game conditions. Building arm strength is critical for a good baseball player. However, to accomplish this you must be ready to dedicate a portion of your time and energy every day to arm exercises. Doing this will help you a long way in gaining professional-grade performance on the field with the rightly-timed throws, well-powered pitches and heavy enough hitting prowess with the baseball bat.